Did you know that the scars after mole removal can be hidden in the natural creases of the face (or body) so well that it’s almost impossible to see them? Well, it’s true. Many people are worried about having moles and skin tags removed, especially on the face, because they are concerned about scarring. 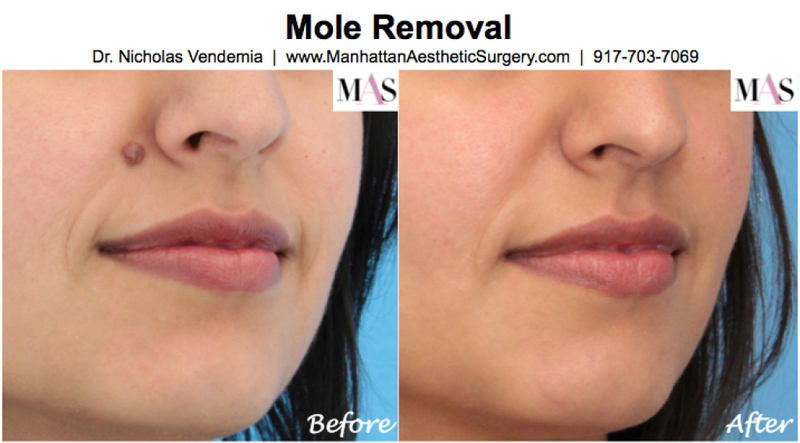 But as you can see from this Before & After photo, even very large moles can be removed with almost no visible scarring. With an experienced plastic surgeon, the procedure is much easier and more comfortable than you think. Mole and skin tag removal is almost always done under local anesthesia in the comfort of the office setting (i.e. you don’t need to go to the operating room and you don’t have to be put to sleep). And of course all moles are sent to the lab to be analyzed for cancerous or other potentially worrisome changes. You will normally have the results within a week or less. Dr. Nicholas Vendemia performs mole and skin tag removal for women and men in the New York metro area. He is a leading cosmetic surgeon in New York City with a reputation for custom care and beautiful results. Feel free to give us a call at 917-703-7069 to schedule a personal consultation, or send us a message by clicking here. Why is a surgical excision usually better than freezing or shaving for moles and skin tags? Freezing and shaving techniques may seem easier than surgical excision, but in the hands of a plastic surgeon that is experienced and meticulous, surgical excisions can actually hurt less, and produce a significantly less noticeable scar. The scars from freezing and shaving in a dermatologist’s office frequently produce round, red scars that can be quite noticeable, especially on the neck, back and chest. In most cases, the thin, fine white line produced with a surgical mole excision can be well hidden with a natural skin crease, and can be nearly impossible to find once it’s fully healed (as you can see in the above photo). In addition, surgical excision always removes the entire lesion, no matter how deep it is, so in the unlikely event that the pathology returns a cancerous or pre-cancerous result, the likelihood of having to do another procedure is vastly diminished compared to a freezing or shaving procedure. Are there any stitches to remove after mole or skin tag removal? It depends on the area of the body on which the mole is located, and on your genetics for scar formation. In most cases, the stitches that a plastic surgeon would use are all dissolvable, but in some cases when your surgeon feels that removable stitches will produce a cosmetically better scar, they may be used. Removable stitches on the body are nearly inconsequential because they can be covered with clothing, and stitches on the face are quite inconspicuous because they are so small. The process of removing stitches is also very simple, quick and painless. How important is sunscreen to keep the scar looking good? For more information about mole removal options, please call our office at 917-703-7069, or send us a message by clicking here. We offer the most innovative techniques and the quickest recovery times in the safest environment possible.